"Now you see him. Now you don't. Now you only THINK you see him... Seriously, is that Ninjara? This "student of stealth" is studying at Ninja College, or as it's officially named, Rasen Ninjutsu University. So let's see if he's got what it takes to pass this test! ...Wait! Where'd he go now?" Ninjara is a playable fighter in ARMS. He is a Japanese college student studying ninjutsu. Ninjara appears mostly human except for his red spiraled irises and his coiled chain ARMS. His green hair is pulled up into a topknot in the shape of a four-pointed shuriken, with chain links to hold it in place. He wears a black, green, and blue suit resembling ninja gear, blue goggles made out of chains, and black and green boots. "Currently training at Ninja College, or as it's officially named, Rasen Ninjutsu University. The ninjutsu techniques of this 'student of stealth' allow him to disappear into thin air and make fools of his opponents! The ARMS Grand Prix doubles as his senior project, and that challenge is the one thing he won't hide from." Ninjara is a training ninja student at the Rasen Ninjutsu University who enjoys reading books. He has come to the ARMS tournament to represent his own university; the headmaster has said that it serves as his senior project. Ninjara's abilities are designed to evade attacks more easily. For example, each time Ninjara blocks an attack he disappears, thus receiving no shield chip damage, and teleports to a different location, which allows him to counterattack. He can also teleport a short distance in the air while air-dashing. Ninjara has some of the best movement in the game, having the fastest and longest dash, and the ability to warp on block and in the air. His great many movement options can seem daunting at first, so Ninjara is considered a character for intermediate-advanced players. His shield-warping ability is a double-edged sword, as it can let him escape from the corner much more easily than most characters, but it's very difficult for him to defend against a rush, as his shield-warp is unreliable in getting him away from such a rapid attack flurry. His strengths come out best when spacing the opponent out from a fair distance, using his movement (which, in most cases, is superior) to get around his opponent's attacks with relative ease and preparing counterattacks all the while. ▲ After getting some advice from a Ninja College alum, distance traveled when performing a mid-air mist warp has increased. "Mid-air mist warp" refers to the ninja technique performed by dashing after jumping. Ninjara?! Didn't see that coming... 60 Play as Ninjara 50 times. rank above master ninja again? 200 Play as Ninjara 500 times. right through those ninja tricks. 100 Defeat Ninjara 100 times. about enrolling in Ninja College? 200 Defeat Ninjara 250 times. Ninjara really paid off. 30 Choose Ninjara in the second Party Crash event and reach level 5 (no longer obtainable), or get it randomly from the random badges (levels 15-30) obtainable in future Party Crashes. in the 2nd Party Crash? Ninjara would be so proud. 30 Choose Ninjara in the second Party Crash event and reach level 10 (no longer obtainable), or get it randomly from the random badges (levels 15-30) obtainable in future Party Crashes. in the 9th Party Crash! Nice work, Ninjara! 30 Choose Ninjara in the ninth Party Crash event and reach level 5 (no longer obtainable), or get it randomly from the random badges (levels 15-30) obtainable in future Party Crashes. 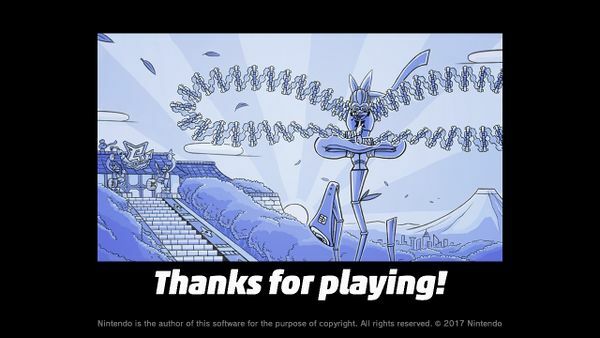 Way to be, Ninjara! 30 Choose Ninjara in the ninth Party Crash event and reach level 10 (no longer obtainable), or get it randomly from the random badges (levels 15-30) obtainable in future Party Crashes. Ninjara vs. Misango! 60 Participate in 1-on-1 matches between Ninjara and Misango adding up to a total of ten or more rounds. Min Min vs. Ninjara! 60 Participate in 1-on-1 matches between Min Min and Ninjara adding up to a total of ten or more rounds. can master any weapon! 30 Defeat an opponent using Ninjara equipped with the Slamamander on at least one ARM. Ninjara was one of the first characters announced as playable, being revealed alongside the game itself during the Nintendo Switch presentation in January 2017. Ninjara was in the original trailer known as "The Elusive Ninja" instead of "The Student of Stealth". Ninjara's voice actor, Kenji Takahashi, also voiced Piston Hondo in another Nintendo game based around punching, Punch-Out!! for the Wii. 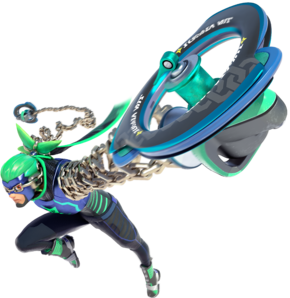 At any given time while playing as Ninjara, the sound of the chains which make up his ARMS rattling can be heard as he moves around. In the demo build, Ninjara had the Chakram, Sparky, and Tribolt. Ninjara's name is a portmanteau of "ninja" and "jara jara," the Japanese onomatopoeia for the sound of a rattling chain. Ninjara says "Kore nite doron!" during the credits, which translates to "I'm going now." "Doron" is the Japanese onomatopoeia for a ninja vanishing via a smoke screen. Ninjara appears as a spirit in Smash Bros Ultimate alongside Spring Man, Ribbon Girl, Min Min and Twintelle. Ninjara's logo is a stylized version of the kanji "忍" (lit. nin), meaning conceal, sneak, or spy, and is shaped like a shuriken. This page was last edited on 28 February 2019, at 15:12.